The Republican primary has been one heck of a rollercoaster ride, first starting off with clown cars and now marching rapidly towards what can only be described as lunacy. What started off with one of the largest fields of candidates in modern history has quickly veered off into the uncharted wild. It is not just ironic but probably a sad commentary about the state of our country’s conservative party that it has come down to a race between Donald Trump and Ted Cruz (Evangelical Trump). No offense to John Kasich but if the only state you win is your home state, you are probably not going to be the presidential nominee. Perhaps Trump or Evangelical Trump will give him the Vice Presidential nod. It is telling that conservatives now must make a choice between, in the words of Senator Lindsey Graham, getting shot in the head or taking a poison pill. If there were a picture next to the phrase “false choice” in the Stanford Encyclopedia of Philosophy, it would perhaps be a picture of Trump and Evangelical Trump comparing wives and measuring their manhood. What in the world has happened to the GOP? Each Republican debate has become a shouting match, reduced to childish name calling, baseless accusations, and outright lies. The man we all assumed would be the frontrunner, JEB!, dropped out of the race. His would-be successor, Rubio, and his 3-2-5-2 strategy failed tremendously. The Last remaining “moderate” (hardly), Kasich, has only won his home state. All the while the elephant in the room grows ever louder and more dangerous. I’m, of course, talking about the walking talking Id of the GOP, Donald Trump. Throughout 2015 and 2016 Trump has used increasingly vitriolic rhetoric and taken increasingly absurd policy positions on issues ranging from immigration (build a wall, Mexico will pay for it) to women’s rights (punish women for “illegal” abortions). He has voiced, on multiple occasions, a total opposition to our current international system – preferring instead to leave our allies out in the cold or treat them as tributaries (nothing screams “modernity” quite like Vassalage). Perhaps next he will come out as a monarchist (sigh). The worst part is that throughout this entire sham of a process the GOP has seldom uttered a word of opposition. The Donald takes what can be understood as traditional conservative positions to their logical extreme, and the GOP establishment must be dragged – kicking and screaming – onto a soapbox to utter even the slightest of denunciations. What a sorry state of affairs. Their habitual silence reeks of complicity. Now, in the final hour, as conservatives must choose between Trump and Evangelical Trump, the GOP has finally woken up. After JEB! drops out. After Rubio drops out. After Trump has taken the GOP and turned it into a madhouse. Now they must muster all their strength to “stop Trump.” It is seldom the case that a frontrunner is routed this close to the convention, but that is exactly what the GOP appears poised to do. I would be hard pressed to find an example in recent history that didn’t end in disaster for the party bold enough to try to undermine the primary process via a brokered convention. It might be time for the GOP to face reality. Trump has tapped into a segment of the electorate that has witnessed the erosion of their lot in life by the very party they have supported for decades, and that genie is not going back into the bottle. Brokered convention or no brokered convention. Whether Donald Trump is defeated in a brokered convention or not, the GOP will feel the effects of his candidacy for decades. Like Goldwater before him the Donald is giving a voice to a dissatisfied base and radically changing the party. Consider Marco Rubio’s concession speech after he lost Florida to Donald Trump. Rubio highlights the anger and resentment many Americans feel throughout this country as they watch their local economies crumble in the face of outsourcing and mechanization. Rubio goes a step further than Trump and correctly identifies the reactionary forces, like the tea party, that brought the GOP to power in the house in 2010 and again in the Senate in 2014, and then, like Donald Trump, he places blame on the “political establishment.” An establishment he believes has taken the vote of conservatives for granted, an establishment he believes has confused cronyism for capitalism, and an establishment he seems to believe he is not a part of. He did, however, make sure to renounce Trump’s xenophobia, racism, and misogyny. Paul Ryan would later follow up on this pattern in his “state of the presidency” address by renouncing his Ayn Rand philosophy and embracing a more populist message (opportunism or change of heart?). Unfortunately Paul Ryan did not go as far as Rubio – he did not directly address the elephant in the room: Donald Trump and his hateful language. The Party of Lincoln will need to do some serious soul searching in the coming months as they approach their nominating convention wherein they may attempt to deny Donald Trump the nomination. Will the GOP be able to stop the ascension of Donald Trump, and what other options do they have? Evangelical Trump is certainly no better. If they cannot stop Trump, will the party split on the issues that Trump has made so central to his campaign? Namely the authoritarianism, the xenophobia (the wall), the racism, and the misogyny. Was Paul Ryan’s address the beginning of an attempt to push the party towards a compassionate populist conservatism that abandons the most abhorrent aspects of Trumpism? Regardless of the outcome, the genie is out of the bottle and the GOP will never be the same. A less vitriolic Trumpism may be the future of the party but at what costs? The imminent implosion of the Republican Party with no viable mainstream conservative alternative will leave the Republicans at a serious disadvantage for years to come, and for those who believe in a robust two-party system it is a shame things have come to this. Curt Thompson is a Senator, serving in the Georgia State Senate – first elected from the 5th District in 2004. Senator Thompson currently represents parts of Gwinnett County and serves as Chairman of Special Judiciary Committee and is also member of the Judiciary, Appropriations, Ethics, and Natural Resources and the Environment committees. Curt also served in the House of Representatives from 2002-2004. 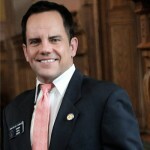 Senator Thompson completed his Law degree at Georgia State University and currently practices law in Norcross, serving a variety of business and private clients with a focus on administrative and corporate law. Follow him on Twitter.